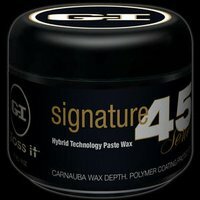 Gloss-Its new 2013 Signature 45 paste wax is our most affordable luxury paste wax, with most "bang for the buck". Especially now its half price and we ship worldwide ! Much like the GI 55 Series wax, this hand poured wax contains 45% percent by volume, the best white Brazilian Carnauba grade 'A' wax.